Eurandom, the workshop centre based at the Stochastics Section of the Department of Mathematics and Computer Science, TU/e, has an extensive workshop and visitor program. Each year workshops in the different areas of stochastics (statistics, probability theory and stochastic operations research) are organized; visitors collaborate with Eindhoven and/or Dutch colleagues. Important assets are the series of workshops for and by young researchers: YESP (Young European Stochastic Professionals). The centre organizes 1 or 2 theme months per year, the so-called Stochastic Activity Months (SAM). These will mostly take place clustered around a workshop, such as one of the YESP(*) workshops. During a SAM, workshops will be organized as well as seminars and/or lecture days. The goal is to bring together a sizeable group of national and international researchers. We aim to devote one month per year to a multidisciplinary subject. (*)YESP = Young European Stochastics Professionals. A series of workshops in all three different research area's of stochastics. They target especially at young reasearchers. By choosing subjects that are high on the international agenda these workshops give the possibility to get more in-depth knowledge in recent developments. See overview of YEP, YEQT and YES. Eurandom is a foundation established in 1997 by NWO and TU/e. The Eurandom board consists of peers from several departments of the TU/e and otherwise Eurandom-affiliated people. The Board is assisted by a Scientific Council, advising on matters of scientific policy and strategy. The institute Eurandom is embedded in the department of Mathematics and Computer Science, TU/e and is located on the campus of TU/e. At the start of the institute, the Ministry of Education, Culture and Science (OC&W) awarded Eurandom with a five-year start-up funding, through a special budget for international facilities. This was supplemented with a start-up funding by NWO and TU/e. At that time, Eurandom was a postdoc institute. It's main goal was to recruit and train talented young researchers and help them to find their way to tenured positions in academic and industry. Maintaining a workshop and visitor program were instruments for collaboration and dissemination. In 2002 TU/e and NWO decided to continue providing the basic funding for Eurandom up to and including 2007, based on the “Eurandom Business Plan 2003-2007”. After this period, priorities for funding within NWO changed and the funding for Eurandom was discontinued. However, in 2007, both the TU/e general board and the department of Mathematics and Computer Science, decided to continue supporting the institute after splitting up foundation and institute. The institute was now able to continue in a new concept: a workshop and visitor centre. NETWORKS is a 10-year program funded by the Dutch Ministry of Education, Culture and Science through the Netherlands Organisation for Scientific Research. Eurandom plays a keyrole in the organization of workshops, funded by NETWORKS. Close ties between the different institutions and the involved researchers have been establised. This makes the way free for high-standard workshops. The program started in the Summer of 2014 and covers a broad range of topics dealing with stochastic and algorithmic aspects of networks. The aim of the program is to address the pressing challenges posed by large-scale networks with the help of stochastics and algorithmics. The focus is on modelling, understanding, controlling and optimizing networks that are complex and highly volatile. Eurandom is part of STAR, Stochastics- Theoretical and Applied Research, the Cluster in Stochastics. Eurandom collaborates with CWI (the national NWO research institute in mathematics and computer science) and with various national research schools in The Netherlands. 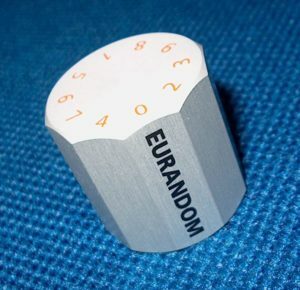 Eurandom is a UMI (Unité Mixte Internationale, 3022) of CNRS. This means that French scientists can apply for a one or two semester stay at the institute. Eurandom is member of ERCOM (European Research Centres On Mathematics) which was founded in 1997, and academic institutional member of the European Mathematical Society. Ercom is a committee of EMS; ERCOM consists of European research centres in mathematical sciences (there are around 20 to 25 members). Directors and administrators of the member institutes meet once a year to discuss scientific and administrative issues, to coordinate scientific actions, and to exchange ideas and information.